The sky darkens and the air browns as the sandstorm comes in. I struggle to run to shelter in the strong winds so grapple hook the short distance to a protective wall. As I hunker down I can see the glimpses of the base’s disintegration through breaks in the dust. Fuel tanks shred and explode in the gale, Black Hand vehicles and soldiers whip past in the wind – anything without concrete foundations is fair game for the storm. When the weather settles down, the enemy base is a wreck. It would take me ten minutes and a ton of explosives to do what the storm has done in 30 seconds. When Just Cause 4 works as advertised it’s an incredible show, marrying an explosion-filled open world and the stunts and gadgets of a Mission Impossible movie with truly awesome extreme weather systems. However, those moments when all the parts of the sandbox come together are crushingly rare, and what’s left is a game that’s less coherent than its predecessor. To me, the Just Cause series has always seemed more generous than other sandbox games. Tools and terrain aren’t drip fed to you through the campaign, but are instead immediately available. As soon as you’re through Just Cause 4’s opening missions you have the entire island of Solis open to you and you’re free to wingsuit, grapple, and parachute across it. Unlike Just Cause 3, that attached a progression system to your mobility gear, in this game your parachute and wingsuit both arrive fully-upgraded. All of this this means that after half an hour of playing I’m reminded of the simple joy of gliding over a luscious land, tipping my arms and swooping between the supports of a bridge. In the island of Solis, Avalanche Studios has crafted another phenomenally beautiful and varied landscape. The north-west is the sandstorm-filled desert; to the east is lightning-plagued rainforest; the south is a grassland, where a single tornado meanders in the valleys; and in the centre is an alpine mountain range wreathed in a blizzard. The immediate freedom to glide over this in a wingsuit is wonderful. As in previous games, you can use your grappling hook to pull yourself along, building speed and gaining height. In theory, and with a lot of practice, you can stay airborne for minutes at a time. It’s one of the few open-world games where I rarely fast travel because the journey to the next objective is its own fun. Though, if you would like to skip ahead, you can fast travel to any settlement from very early in the game, whether it’s in a region you control or not. Just Cause 4 introduces a new system to the mix, that sees you building an army to take Solis from the grip of the Black Hand. As you create chaos, destroying marked structures such as fuel tanks, radar dishes, antenna towers, and enemy vehicles, you’re rewarded with new recruits. Whenever you fill the chaos bar you’re assigned a new squad which you can deploy on the map screen to take over one of the thirty or so regions Solis is carved into. Each region has a Black Hand base that can be conquered by completing a mission and, once the sector is under your control, you receive a new item or vehicle which can be delivered as a supply drop from a cargo plane. You’re still Rico the rebel of previous games, but Just Cause 4 pushes to make you more than a one-man army. You’re now a general of the revolution. While technically a bug, Just Cause 4’s spawning adds surreal fun to the game. You’ll sometimes arrive at the sea to see a flotilla of boats spawn 20 metres up in the air and fall to the surface of the water. Sometimes this won’t even happen on the coast. I came across a warship stuck on dry land in the jungle, firing its cannons at a helicopter. I can’t decide if it should be fixed or embraced by Avalanche. However, in practice I found the new metagame to be disappointingly static. Yes, the edges of regions you control are in constant war against the Black Hand, the frontline forever shrouded in smoke and shrapnel. But it’s all for appearance. If you drop behind enemy lines to help out your Army of Chaos on the battlefield, no matter how many Black Hand soldiers you kill or tanks you destroy, your forces won’t move forward and engage in the fight. 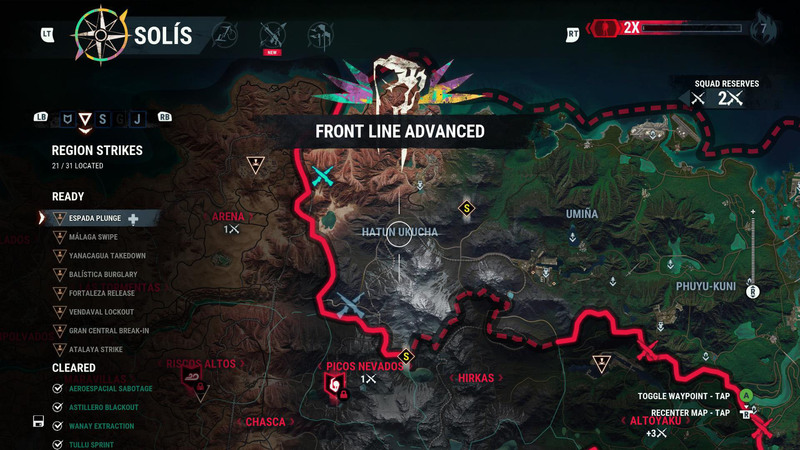 The battle line only moves when you complete the mission in the next region over and deploy a squad to take it for you. This all happens on the map screen, and it’s not an invasion you can see or take part in. Occasionally the frontline factors into play. When taxiing a group of recruits between villages destroying Black Hand supplies, I take a direct route and drive through the frontline to reach one of the towns. It’s a blast, weaving the humvee between mortar shells and tank fire. But this is one instance in 15 hours of playing. For similar reasons, the weather systems are a let down, too – they so rarely collide with my unscripted activity. When the sandstorm sweeps through a base I just happen to be attacking it creates a whole new, exciting playspace. However, I never encounter the other weather systems by chance while I’m in their regions. When in the grasslands the tornado is almost always visible – you can travel to it and watch it carve through an enemy convoy. Despite this, I never have to contend with it unplanned or outside of scripted events. The campaign mission that sees you chase down the tornado is exciting, and shows you its raw power, but it doesn’t add much to the sandbox. One system that has enriched the Just Cause 4’s systems is the new grapple hook. In previous games you could tether items together – for instance, tying an enemy soldier to an exploding fuel tank as it boosts into the air, sending them both flying into the sky. In Just Cause 4 you’ve now got a lot of new toys to grapple with. They all break down into three camps – retractors, airlifters, and boosters. And, as you complete more missions across Solis, you’ll receive points towards upgrading them. The retractors draw two tethered objects together. Modifications allow you to change the strength of the retractors’ pull and the manner in which they’re deployed. For instance, you can have them gently pull a tethered object until the cable snaps, or give a single hard yank. I find a sadistic joy in tethering an enemy helicopter to the ground with a slow, strong retractor, watching as the AI tries to keep its rotor blades from clipping the soil before failing and exploding into pieces. Airlifters attach balloons to an object and, so long as you attach enough of them, will float it up into the sky. You can fill the lifters with helium or explosive hydrogen. And you can set them to drift away, follow you, stay at a certain height, or pop when they get to a particular altitude. They’re an incredibly silly toy, and one of the best additions to the series. Especially as you can attach airlifters to anything – tanks, soldiers, or, er, cows. Boosters, meanwhile, are little rocket jets that will propel whatever they’re attached to forwards. Stick one to an enemy’s leg and they’ll immediately do the splits and spin away like a fleshy catherine wheel. Slap a couple on the back of your car to give it a accelerative thump. Or, if you’re feeling creative, float a boat with some airlifters and use boosters to fly it over a nearby airport. It really messes with a pilot’s confidence to see a fishing trawler pull up next to them on the runway. For years now, a dedicated community of Just Cause players have been steadily creating grand and explosive Rube Goldberg machines with the game’s tether system. These new tools to modify the grapple hook will give them a ton of options to play with and I’m looking forward to seeing what they come up with. Whether it be a cloud of exploding barrels that follow you into a base or simply seeing how far they can send an alpaca over Solis. 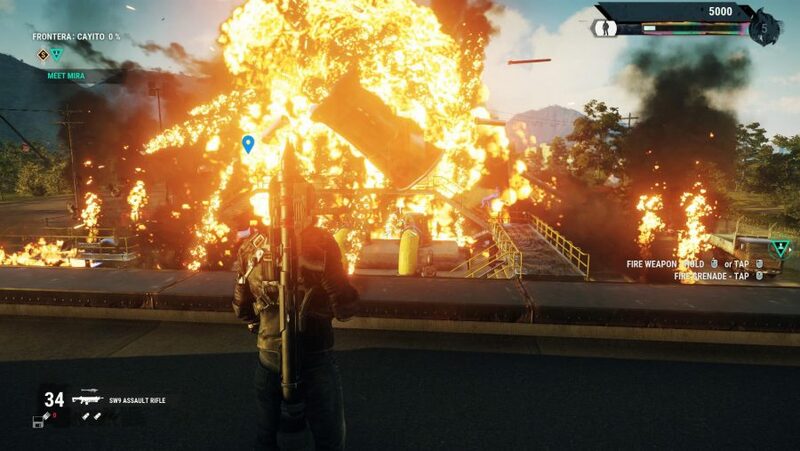 Just Cause 4 is a hard game to judge. It’s ridiculously good fun to play. It’s beautiful to look at and explore. The partnership of its grapple system and physics engine invites you to play with it. But all of that was true of Just Cause 3, as well. Each of the series’ returning features have been fine-tuned and improved – grapple mods are the flagship example, but even small things like being able to target supply drops to fall exactly where you want them, rather than randomly in your vicinity, is a nice touch. But the really big new systems – controlling the Army of Chaos and the extreme weather – both promise to be more engaging than they actually are, and don’t fold in with the better established systems of the series. 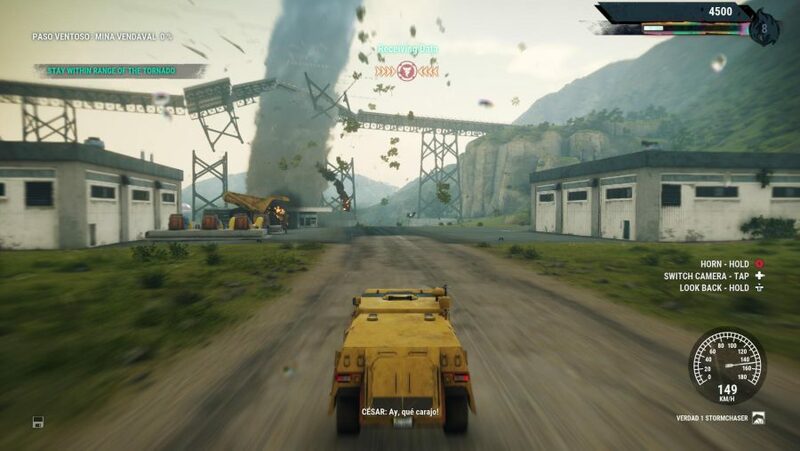 If there were more moments like when the sandstorm ripped through my play without warning, forcing me to adapt, then Just Cause 4 could be a great game. Instead, it’s simply very good. 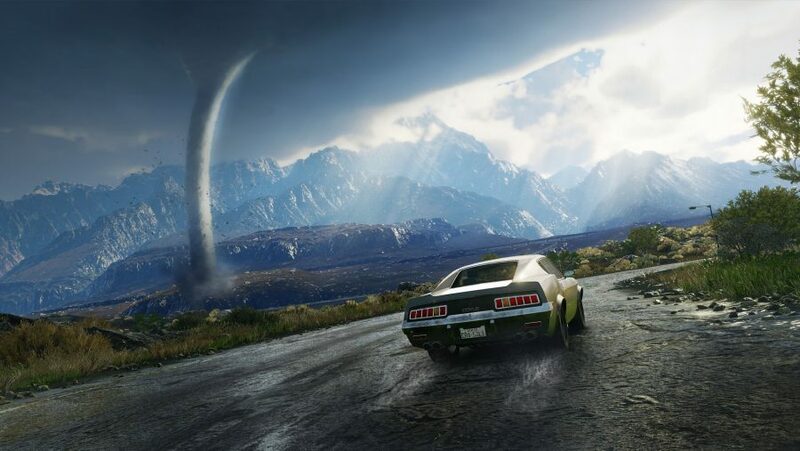 Avalanche Studios’ sandbox refines everything that made its predecessor great. It’s still one of the most generous and bombastic open world games, but its new systems don’t progress the sandbox as much as they should.